When it comes to putting together a modern marketing team for the digital age there are a few things that are of upmost importance according to Mike Volpe. HubSpot always aims to hire A+ people. This seems like a no brainer for anyone hiring marketing staff but interestingly HubSpot has studied the results of not hiring A+ people. They found that A people tend to look to hire people smarter and more competent than themselves. That way you build an organisation which is constantly in an upward spiral with ever increasing capabilities. B people, on the other hand, tend to hire C people; C people tend to hire D people and so on – thereby creating a downward spiralling organisation with ever diminishing capabilities. Thus not constantly looking to hire A+ people will inevitably lead to waning organisational capabilities. So what makes someone an A+ person? One of the most important things to look for is what HubSpot calls the GSD factor – people that Get Stuff Done. That is, people that deliver what they set out to do. It’s one of the most important characteristics in any team environment and without it no amount of training and coaching will make any difference. Digital – you want people who “speak digital fluently without accent” meaning that you want people who are well accustomed to the online world and knows how to navigate it. This typically means people who are well familiarised with many of the services, formats and functionality of the online world. Analytical – you want people with an analytical mind set, people that get excited about metrics and measuring. In the online world everything is measurable and if you work according to an inbound marketing methodology it’s imperative that you let metrics guide your decisions on e.g. where to focus your resources. Reach – you want people with “gravitational attraction” i.e. you want people with large personal networks online, e.g. people with 500+ connections on LinkedIn. 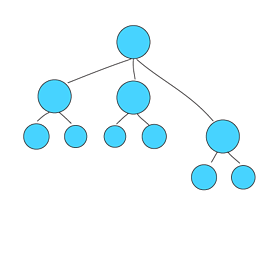 If you have a lot of team members with large personal networks you can benefit from “network effects” by spreading your content and communication in their networks. Content – you want people who create content naturally. Content marketing is at the heart of inbound marketing and you don’t want content creation to be a struggle. To have a team that excels at creating content, and does it effortlessly as a natural way of working, goes a long way when it comes to succeeding with inbound marketing. 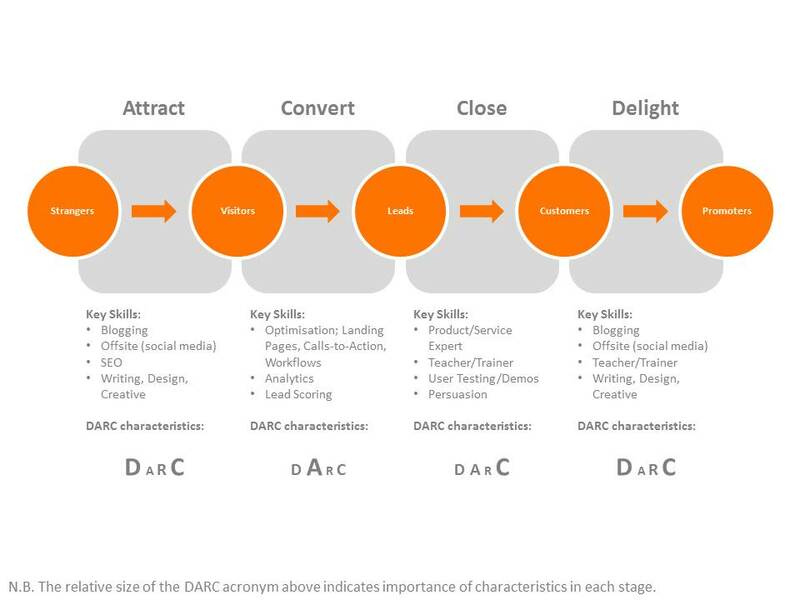 If you are doing marketing according to the inbound marketing method you should aim to have people in place to cover all the stages in the process and that typically means people with slightly different skill sets or at least with different emphasis on the four core DARC characteristics above. Since there is still quite few people that are skilled in modern marketing and inbound marketing methodology it make sense to keep track of the ones you come a cross. You may meet people you think are potential A+ marketers at conferences, networking events, through referrals, connections on LinkedIn and so on. Try to keep a list of 20-30 potential A+ marketers that you keep in touch with and follow what they do, what they write or post about, who they connect with on LinkedIn and so on. That way you will have a good place to start once it’s time for a new hire. Once it gets time to interview potential candidates there are a few tell-tell signs to look out for. For example, people using old ISP email addresses, Hotmail addresses or plain old paper CV’s are unlikely to be clued into modern online marketing. You want people that can demonstrate a track record of success, growth and inbound marketing experience and expertise. When you interview them you should ask questions about the inbound marketing funnel (Attract, Convert, Close, Delight) to assess how familiar they are with that line of thinking. You should also ask questions to test their analytical skills and check if they have an understanding of strategy. The latter can easily be done by showing two completely different websites and ask what they think of them (hint – ideally you want them to ask what the purpose, mission and objectives with each website is before they start answering). Show early results – once people see the results of an inbound marketing approach it’s much more likely they will buy into a new way of working. Test if people are coachable – it’s ok if not everyone is up to speed with everything from day one as long as they are coachable and can develop and grow into their new role. Help people transition – help e.g. “the advertising guy” to become "the content storytelling guy" and make them understand that their unique skill sets are transferable to a new way of working. 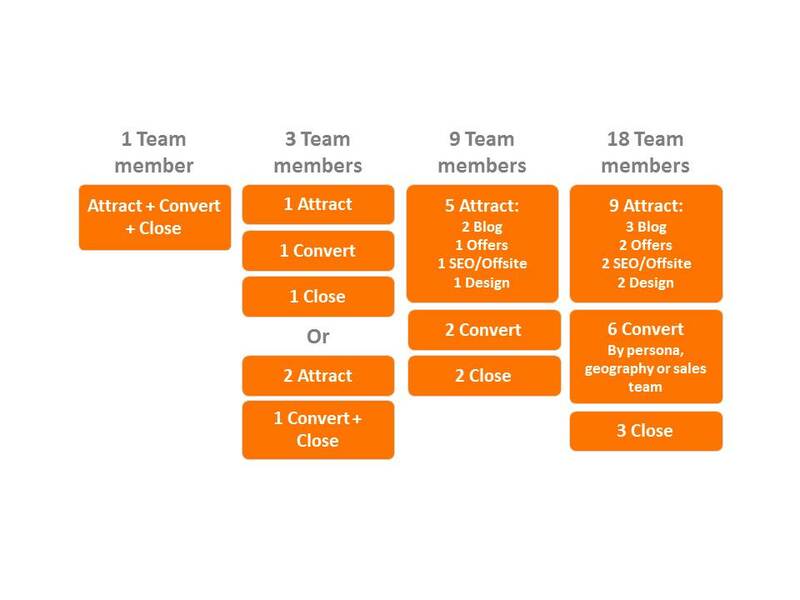 The number of people in your team will decide how to best organise for a successful inbound marketing process. If your team is small you should aim to have generalist who can cover all parts of the inbound funnel. If you have a larger team you can have specialists focusing on just part of the funnel. Below is a recommendation of how to best organise your team based on 4 different team sizes. Do you want to learn more about Inbound Marketing and how to get started?